by waves, rocky shores, sugar cane fields as far as the eye can see, and mountainous terrains offering magnificent panoramas. The Northern part of the island host the bustling capital with markets and gardens. 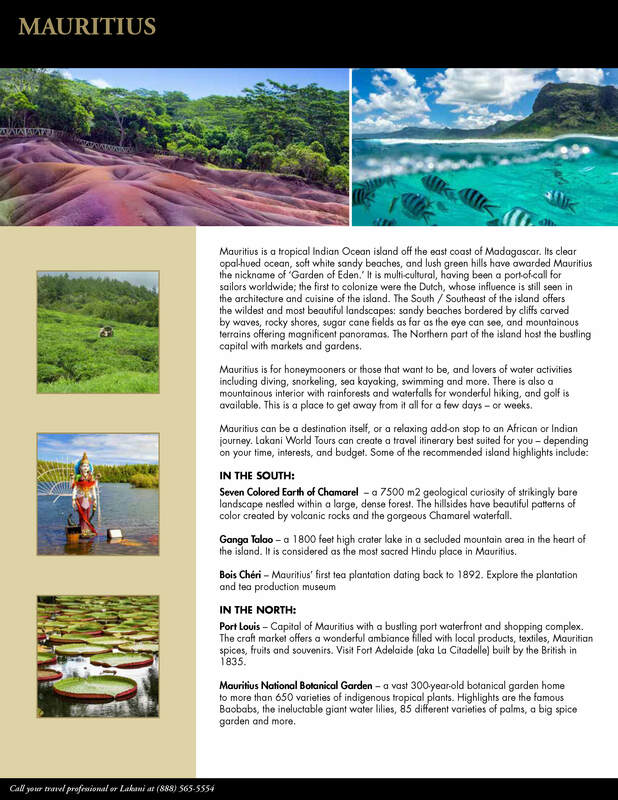 Mauritius is for honeymooners or those that want to be, and lovers of water activities including diving, snorkeling, sea kayaking, swimming and more. There is also a mountainous interior with rainforests and waterfalls for wonderful hiking, and golf is available. This is a place to get away from it all for a few days – or weeks. Seven Colored Earth of Chamarel – a 7500 m2 geological curiosity of strikingly bare landscape nestled within a large, dense forest. The hillsides have beautiful patterns of color created by volcanic rocks and the gorgeous Chamarel waterfall. Ganga Talao – a 1800 feet high crater lake in a secluded mountain area in the heart of the island. It is considered as the most sacred Hindu place in Mauritius. Bois Chéri – Mauritius’ first tea plantation dating back to 1892. Explore the plantation and tea production museum. Port Louis – Capital of Mauritius with a bustling port waterfront and shopping complex. The craft market offers a wonderful ambiance filled with local products, textiles, Mauritian spices, fruits and souvenirs. Visit Fort Adelaide (aka La Citadelle) built by the British in 1835.
to more than 650 varieties of indigenous tropical plants. Highlights are the famous Baobabs, the ineluctable giant water lilies, 85 different varieties of palms, a big spice garden and more.